During the past several years, AU has taken considerable strides in sexual violence prevention advocacy. The establishment of the Title IX Office, along with SPA Professor Jane Palmer’s survey on Sexual Violence Dating Violence, and Bystander Behavior are just a couple examples that show the AU's commitment to prevention and support for survivors. AU’s work received national attention when EverFi recognized AU with its EverFi’s Prevention Excellence award in 2017 for the work of the Health Promotion and Advocacy Center (HPAC). Though the school has taken steps forward, this is only the start towards preventing sexual violence on campus. HPAC has been the campus leader on dating and sexual violence prevention advocacy. Because of its work, It's On Us granted AU the opportunity to host its first-ever regional advisor summit at American University on Aug. 4 and 5. AU was able to host this summit thanks to the energy and involvement of a recent alumnus. Thomas Florczak, CAS/BA ’17, a former member of the Sexual Assault Working Group (SAWG), wanted his fraternity, Zeta Psi Fraternity, Inc., to partner with It’s On Us and reached out to Elvin Bruno Jr., who is the Campus Program Director for It’s On Us. Florczak connected Bruno with Maya Vizvary, AU’s Sexual Assault Prevention Coordinator within HPAC. Vizvary and Bruno corresponded throughout the 2017-2018 academic year, and Bruno was impressed by AU’s work. 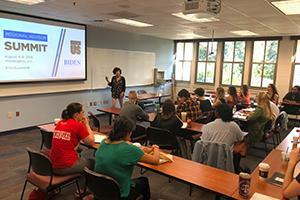 “They were interested in having Empower AU implemented across the country as part of the curriculum for their campus partner network,” Vizvary said. “American University took strong steps in bringing strong programming to different sectors of campus in the field of sexual assault prevention,” Bruno said. Florczak is pleased that his minor role allows AU to sponsor the summit. “AU invests many resources into having a high-quality consent education program, and I thought it'd be useful for Elvin to connect with someone at the Office of Advocacy Services for Interpersonal and Sexual Violence (OASIS),” Florczak said. Although the arrangement for Empower AU to be part of the It’s On Us program did not transpire, Bruno and Vizvary maintained their communication. That bond drove Bruno to suggest that AU host the first summit. “We chose AU because of our strong working relationship with Maya Vizvary and HPAC,” Bruno said. On Aug. 4 and 5, AU hosted 16 regional student leaders and two It’s On Us staff members. The accommodations for both nights was provided through in-kind donations from University Conference and Guest Services (UCGS) and Auxillary Services. “Since this is a conference of a smaller scale, those departments agreed to do it,” Mickey Irizarry, Director of HPAC, said. The regional advisors had the opportunity to network with peers, listen to leading experts, develop their abilities and proficiency, and be emboldened to take this knowledge back to their regions. “The goal of this workshop is to equip our regional advisors with the resources and skills they need to be successful in empowering the campus chapters within their region to combat campus sexual assault by engaging young men and changing the culture on campus,” Bruno said. Vizvary was excited by the collection of leaders in the room. “It was wonderful to see student leaders from around the country and national leaders in this field come together and talk about how to prevent campus sexual assault. I was inspired by the collective expertise and hopeful energy in the room,” Vizvary said. Irrizary shared Vizvary’s hopefulness. She said she is looking forward to using the tools from this forum to help students take on leadership roles in the It’s On Us campaign at AU and other campuses.